Well of course I hope to be many years from the grave, but this is an expression which I could easily attach to my lifelong love affair with the New Forest, which is now just a 45-minute drive from where my wife Debbie and I live in Hampshire. It all started in the late 1960’s, when my parents would drive my three brothers and I, in our blue Ford Cortina Estate (reg. HGF 112C! ), from our home on the Kent borders of South East London, to Hollands Wood campsite in Brockenhurst. Things were different back then; it was OK to light fires, and there were no toilet facilities, so a shovel was required to dig a hole! As kids we totally got into the swing of it, and it was all just part of the adventure! Brockenhurst has usually been my choice of location, partly because it is so easy and quick to get to from London Waterloo by train (plus I didn’t learn how to drive until quite late in life). As time moved on, and more disposable income became available, the hotel accommodation became more luxurious, and rather than fish ‘n chips (excellent though they are) or a pub sandwich, we started to sample some of the more fine-dining-type establishments which continue to grow in number in the National Park. 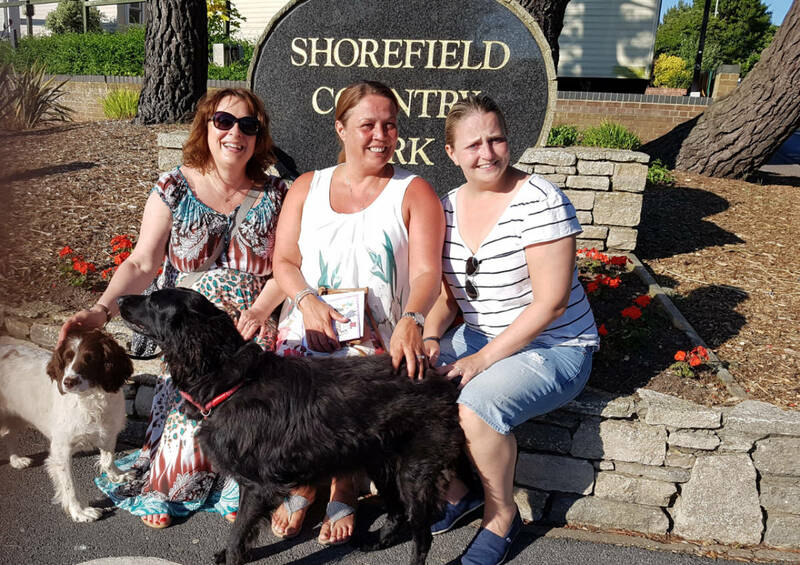 But it’s not all about comfy hotels and posh food, we are also regulars at Shorefield Country Park, one of many excellent holiday parks dotted around the forest. Totally dog friendly, we stay in a Scandinavian-style lodge (number 15, always the same one), and our Flat Coated Retriever, Billie, and Springer Spaniel, Poppy, absolutely love it there. Lovely, long walks along the beach. Perfect. The park is a short walk from Milford-on-Sea (people forget that the New Forest also has a coast), which has some great pubs, most of which are dog friendly; it’s a lovely village with an excellent fish and chip shop (the queues on a Friday are testament to how good it is), a dog-friendly wine bar, and great Thai and Indian restaurants. So, over the years, I have experienced, first-hand, many ways in which to enjoy a short (or long) break in this fabulous destination and, a few months ago, I started working with ‘Go New Forest’ in a PR capacity. As far as I am concerned, that really is living the dream.